Is 2008 the Year of Multi-Touch? 2007 was the year of the iPhone. 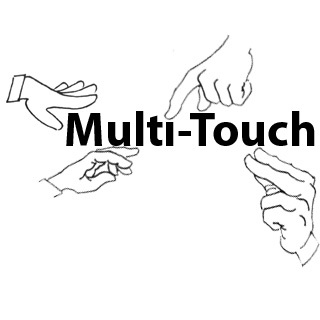 2008 might turn out to be the year of multi-touch. Multi-touch is the core of the iPhone- without it, the iPhone is just a piece of hardware running OS X. With the introduction of the MacBook Air and the multi-touch trackpad, Apple has ushered in a new way of interfacing with our computers and may change the era of computing yet again. No stranger to the GUI and innovative input devices, Apple has re-defined our ways of interacting with technology. In 1983, Apple pioneered the mouse and the Graphical User Interface (GUI) with the Lisa, and later the Macintosh. A culmination of technology from Xerox PARC (Palo Alto Research Labs), the way we interacted with computers was changed forever. Ever since then, we are still interacting with computers in relatively the same way. Trackballs were introduced shortly after the mouse, for specialty or mobile use. In 1994, Apple began to ship trackpads in replacement of trackballs on PowerBook models- the first company to do so. To this day almost every laptop now has a trackpad. Besides these small refinements, there has been no technology truely breaking away from the mouse. Multi-touch, however isn’t going to replace the mouse either. It is simply enhancing the interaction with the user to make things easier and more intuitive. For example, zooming into a picture would require going to a menu and zooming in, clicking a button or hitting a key command multiple times. On a multi-touch trackpad, that translates to pinching your fingers together in the desired direction. Reading a webpage, and want to go back? Simply swipe your fingers back. The potential of multi-touch is almost endless, and it is only natural that Apple is now integrating it into their laptops. For those familiar with two finger scrolling found on current Apple laptops- it is hard to go back. Over the coarse of this next year, we will definitely see multi-touch make its way into more of Apple’s products. We should also begin to see other manufactures follow the lead and integrate multi-touch into their products, be it laptops, cameras, cell phones or GPS devices. This has potential to change the way we interact with technology- just try comparing the experience of the iPhone to some Windows Mobile devices! Technology is continuing to integrate itself into our lives deeper and deeper- and continues to become less and less obtrusive. For example, the Nintendo Wii shattered the gaming industry by creating a remote like controller that can become a baseball bat, crossbow or steering wheel depending on the game. Surprise- the Wii is the currently the best selling ‘next-gen’ console, shipping over 20 million units in one year. Apple changed the cell phone industry forever with the iPhone and has since sold 4 million in almost 7 months. Multi-touch is here to stay, and so is a new standard for technology. People are fed up with clunky interfaces and complicated devices. Apple has been a large part of this movement, first with the iPod (and iTunes), now with the iPhone and multi-touch. Even Microsoft has developed a multi-touch interface, named “Surface” that will come out later this year. 2008 will most certainly bring large growth of multi-touch devices and with that: a new way of using technology. We were drawn to the Macally booth by a prototype iPhone Keyboard. Upon further inspection we found details were light- no one could fully answer our questions. All the products on display in the booth were “non working prototypes”. Very interesting product, never-the-less. Check out the video for the full interview! This is a throwback from 2003, the 10.3 Panther Introduction video. It has been added to The Daily iLife podcast today, which you can subscribe to in iTunes or watch here. 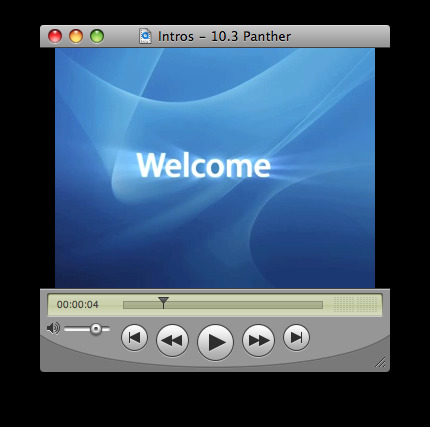 The introduction movie for 10.3, OS X Panther played after a successful install.